Or when all else fails, shoot swans!! Scooting along on the ice trying to slide on his chest and move his feet on the ice. Oh my gosh. Poor baby. This does NOT look fun. Great shot, though! Great capture!! Did he manage to get off the ice? How cool. 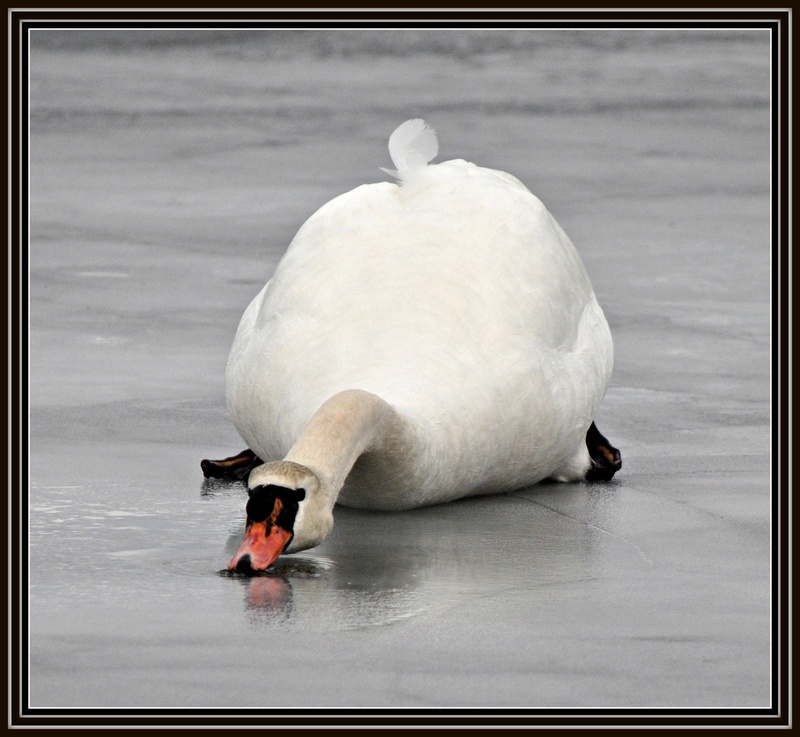 Poor cold swan, though! Oh dear he does look stuck, great shot. Hope he got back to clear water. @pamknowler Nope but he could of if he would have wanted. He stayed there the whole time I was there and there were 3 other swans way back on the pond in the clear non frozen water. Aaw !! bless -- brains also frozen ? Great picture. but I guess not so great for the swan. He looks like he has the winter blues. Great shot. Love it! Like me learning to ice skate when I was little - lots of work to moving a short distance. Love the pov you used to catch this guy. I do like - and agree with - your updated bio, Myrna. You do wonder why all people can't be like this marvelous group here on 365. Wonderful capture, must have frozen his tail feathers! Poor swan. Great capture, though. What a wonderful shot but what a poor thing trying to move along. Oh poor baby - this is a little sad...hope he was OK.
Awwww, a bit sad but what a beautiful timely capture. I think he could use some ice skates! It's a fav -- love that little feather sticking up and this certainly is unique compared to the usual graceful swan shot. Lol! But probably not for the swan!! A video would have been especially appropriate! What a laugh! We always think of swans as being so elegant and regal. Who would think the ice could reduce them to a silly bird!? Great shot! !